A narrow boat partially sunk today on the River Nene after taking to the water despite warnings about very strong streams. 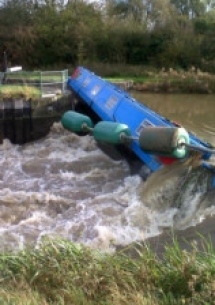 At about 3pm the boat came into trouble on the River Nene in Ditchford, despite advice and warnings from the Environment Agency about dangers. 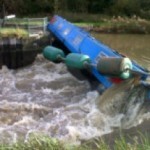 There were two people on the boat when it became lodged at a sluice gate. Fortunately they were able to get off to safety without being injured. The owner of the boat has arranged for it to be recovered, in this situatuon a good boat insurance policy would be vital! There had been a strong stream warning issued by the Environment Agency before the boat sunk, because of high flows on the Rive Nene. A spokesman from the Environment Agency this afternoon said: “We would recommend every boater to sign up for the strong stream advice service and to take the warnings very seriously when they are issued. This free warning is sent to any boaters who sign up for the service when flows reach a level that could be dangerous to boaters. A spokesman said notice boards are displayed prominently on the riverbanks to inform boaters of the status of the river and red flags are also raised at several boat clubs. Compensation Reforms: Will Premium Prices Increase?